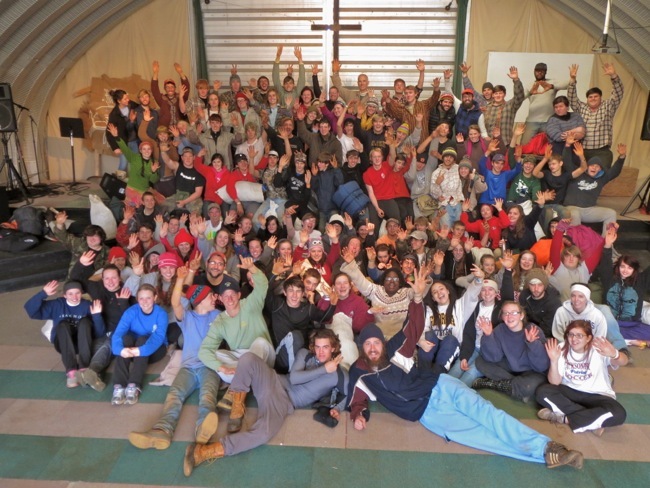 Learn & Serve: Fall 2013 Retreats Wrap-Up! It’s been a busy fall for Learn & Serve at SIFAT! We have had so many wonderful groups from across the southeast come to our campus in Lineville, AL for L&S programming. As we slow down for the winter season, we wanted to share a glimpse of this past season with you! Learn & Serve: Birmingham Youth Support SIFAT Training Graduate in Nigeria! Pastor Ogbatabo is a pseudonym for one of our SIFAT graduates and trainers in Nigeria. Because of his work in a violent area, we want to protect his identity for his safety. Pastor Ogbatabo submitted a proposal to SIFAT, which was approved as a SIFAT international project. SIFAT’s Learn & Serve department pledged to help Pastor Ogbatabo fund his project through educating North American youth on the issue of smoke inhalation around the world and allowing them the chance to partner with SIFAT through financial contributions. Several L&S staff members and leaders from various participating groups have contributed. 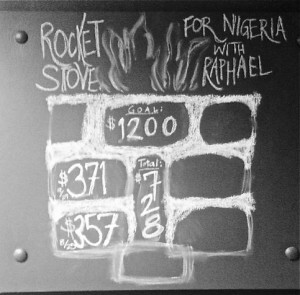 One inspiring story of a group committing to fund Pastor Ogbatabo’s project comes from Canterbury United Methodist Church of Birmingham, Alabama. When students from Canterbury UMC met Pastor Ogbatabo while at SIFAT during Summer 2013, they decided they wanted to sponsor his project in Nigeria. After telling their friends and parents about Pastor Ogbatabo and his work, they decided to take up an offering once a month at their Sunday night youth program. Canterbury UMC students keep a tally of the amount raised each month on their prayer (chalkboard) wall in a drawing of the rocket stove. Learn & Serve: March Madness! While the world is gearing up for NBA March Madness 2013, the Learn & Serve staff is ready to hit the court for one of our busiest months of the year! March brings many groups to SIFAT’s campus for a variety of programs. L&S currently has more than 15 events scheduled next month with an estimated 750 participants coming to our campus during Spring 2013! Groups will be participating in a variety of L&S programs, as well as using our facilities for their own retreats. We also have several groups coming specifically to volunteer their time to help improve our campus through work projects. Please be in prayer for these participants as they come to SIFAT for their retreats. Pray they will feel the Lord’s presence and learn the lessons he has for them here. Also be in prayer for our staff as they prepare for the busiest weeks of the year. Pray for their energy and hearts as they attempt to share God’s love with all those who come to our campus. Are you coming to SIFAT for a retreat next month? Let us know! Comment on our blog, tweet at us, or visit our Facebook page and tell us why you are excited to come to SIFAT! Learn & Serve: “48: A Slum Experience” Retreat! January 19-21, 2013, eighty participants and thirty-four staff stepped into the life of over one billion people on the planet at “48: A Slum Experience”. This intense retreat allows high school participants, adult leaders, and college-aged staff to experience life in an urban slum environment. Participants and staff of the 2013 “48: A Slum Experience” retreat celebrate gaining a new awareness of slum life around the world. Happy 2013! Learn & Serve is excited to begin celebrating another year and looks forward to hosting many groups this coming spring! Spring is a great time to bring a group to SIFAT to engage in the multiple programs Learn & Serve has to offer. 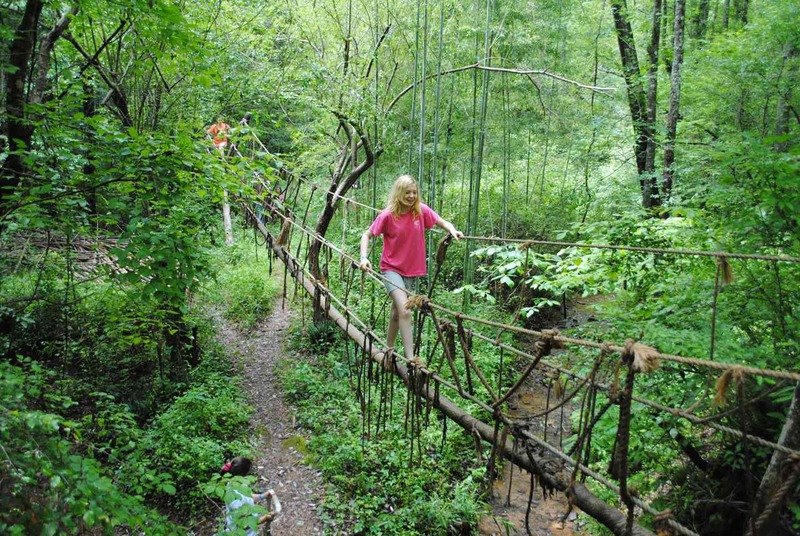 While Learn & Serve offers overnight retreats, an interactive day trip called Around the World is also offered that is especially appropriate for public, private, and home-school groups, as well as families and scout troops. 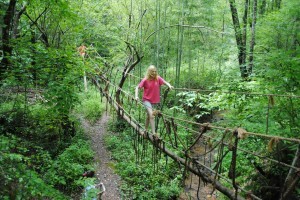 A participant crosses a model Andean rope bridge in our Global Village during an Around the World rotation.